LGMD2I is caused by mutations in the FKRP gene, encoding a putative Golgi-resident glycosyltransferase called fukutin-related protein, which is involved in alpha-dystroglycan glycosylation, a process that is required for its functional activity as a receptor of extracellular matrix component. Loss of dystroglycan function may underlie muscle weakness and cardiomyopathy. The altered membrane structure is not related to a loss of a structural component but by reduced activity of glycosyltransferase. Most of the FKRP mutations are rare, but the c.826C > A mutation is common. The clinical phenotype in LGMD2I is heterogeneous, including asymptomatic patients, cases with a severe early-onset type of Duchenne muscular dystrophy, and patients with mild late-onset muscular dystrophy with slow progression. Dilated cardiomyopathy and severe restrictive respiratory insufficiency have been reported in several patients. 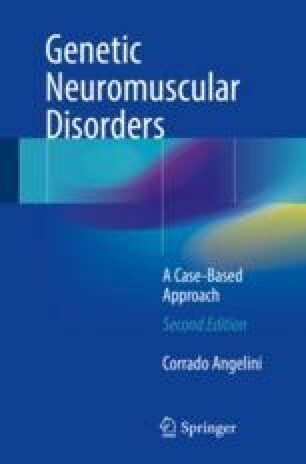 Muscle involvement in LGMD2I includes proximal distribution of weakness in the limbs, with the hips more affected than the shoulders. Calf muscle hypertrophy is common. FKRP mutations have also been reported in a severe form of congenital muscular dystrophy (MDC1C) and in congenital muscular dystrophy complicated by structural brain abnormalities.